This is a Nice Apollo 1500 Swing Gate Operator. It features the Apollo 635 circuit board. Solar-compatible: 12 V battery can be charged by either solar or AC power. The choice is yours! Reliable in any condition: in the event of electrical power outage or significantly overcast days, a fully charged deep-cycle marine battery (recommended) will provide up to 300 cycles or 30 days usage on a basic system before requiring a recharge. 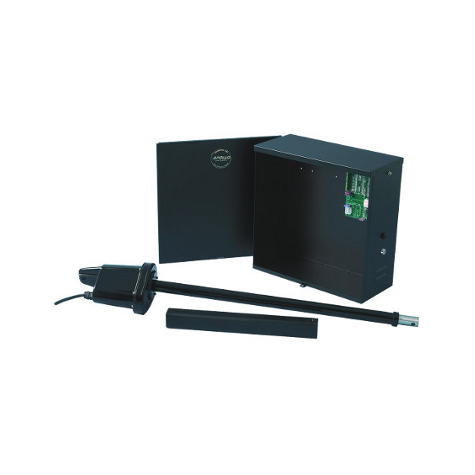 Easily installed on most existing and new gates with practical external adjustment of the limit switches. Ideal solution for special applications: can be used in push to open or pull to open mode, thus increasing the flexibility of having the actuator inside or outside the gate, regardless of hinge left or right or direction of gate-swing. The direct-drive system attaches directly to the gate. Quality and durability: features weather-resistant NEMA 3R, powder-coated black housing. Actuator has rust-proof linear acme screw drive and self-lubricating gears. Supplied with 8 ft. of cable.